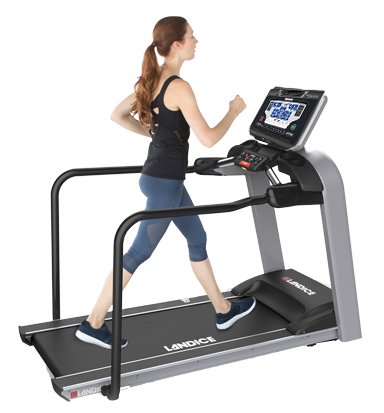 Zero starting speed and extended parallel medical handrails make the L7 Rehabilitation Treadmill ideal for rehabilitation, physical therapy, and sports conditioning. The L7 can also be equipped with a reversing belt and orthopedic suspension system. The L7 surface is 50.80 cm x 147.32 cm (20” x 58”) and has a 181.44 kgs. (400-pound) user weight capacity. Since 1967, we have been engineering, assembling and testing the finest specialty fitness equipment on the market – and one of the only manufacturers to do so in the USA.